Clovis, New Mexico: New Mexico Council of Teachers of English, 1987. This is the August 1987 issue of the New Mexico English Journal, published by the New Mexico Council of Teachers of English. 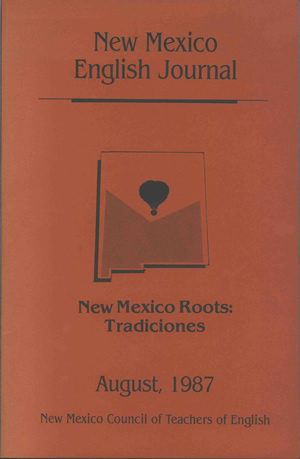 Entitled "New Mexico Roots: Tradiciones," this issue contains an article by Tony Hillerman reprinted from the June 1987 issue of American West. The article is on pages 3-6 of this issue and is called "Enchanted New Mexico Is One of Ours." In the article, Tony Hillerman discusses the lack of awareness of New Mexico statehood in some other parts of the US, as well as the history, culture, and natural beauty of New Mexico. Binding: Red paper covers. The spine is blank.